This week I’d like to share a post from my writing friend Jessie Heninger and her blog Confessions of a House Wife. Jessie’s writing is like a warm blanket on a frosty day. Her storeis always leave me feeling snuggly warm all over, and I love how she writes about the truly best things in life. To learn more about Jessie or to read more her often funny, often crazy, often moving tales visit: www.jessieheninger.wordpress.com. I spent most of my childhood years in the Upper Peninsula of Michigan. The snow really takes a toll come May but at Christmas time it’s simply magical. You can’t imagine how lovely a place that is mostly wooded, even in town, is when it’s covered in white, white snow and sparkling ice. In the Upper Peninsula we always cut our own tree. You can get a special tag from the DNR and go to the actual forest and cut a real wild tree. It was always a tromp through deep snow and a race against the fading daylight to find the right tree, which usually ended up being quite crazy looking, having never been privy to pruning, with crooked trunks and crooked boughs. This particular year, however, we piled into the van and went to the local tree farm. We wore sneakers, not snow boots, and jackets instead of coats. There was not a flake of snow to be found. We cut our nicely manicured tree and the nice workers loaded it up into the back of the van. I froze. I was sitting in the tree! “What do you mean?” my mom asked casually. “Like the tree is moving,” she answered, her voice sounding frantic. And, that’s when I saw it. The tree was alive with insects! Hundreds of bugs, which up north had long been killed by snow and ice, were alive and well, living it up in our Christmas tree! And we were sitting in the tree, with nowhere to go! Only miles and miles of bug infested, snow free, travels ahead of us. Honestly, I get itchy just thinking about it. I’m sure there were screams and tears. I am CERTAIN that my youngest sister laughed, (the little twerp.) I can still remember how the tree smelled after my dad sprayed it with bug spray. This bug tree memory is burned into my brain…and I am so very glad. That was a hard year full of changes. I’m glad that I have this memory to look and laugh at. A moment in time that truly set my family apart from the other people in our lives. A moment that bound us closer together. I remember that Christmas, even though there was no snow, so fondly; the three of us sleeping together on mattresses on the floor in the room with the yellow and orange floral wall paper that would soon be torn down. How the room echoed with our whispers on Christmas Eve night because there was no furniture or pictures. The funny smelling tree in our sun room where we opened presents sitting on porch furniture. I remember us being together and being happy. Despite the fact that we were in a different place and environment, we were together. Somehow the magic of that Christmas made our togetherness a magic all its own, cocooning us in the love we shared for each other. As I sit to write this week’s post I’d like to tell you that I’m listening to the soothing sounds of Nat King Cole singing “Chestnuts Roasting on an Open Fire.” Doesn’t that sound lovely? However, that is not exactly the case. Instead of Nat’s peaceful crooning, I’m listening to the not-so-peaceful strums of hammers pounding and power saws whizzing from my kitchen. With less than two weeks left before Christmas, my house is undergoing a major renovation. New floors, new counter tops, a new fridge and dishwasher, and new windows, are all finding their way into our home between now and Christmas day. I know what you’re thinking. New windows in Michigan, in December, the week before Christmas? Who does that? This stroke of brilliance wasn’t my choice. My mom and dad, who I live with, have wanted to do these repairs for years, and I know this isn’t exactly the timing they had in mind either. A couple of weeks ago, on the Monday after Thanksgiving, I woke up feeling discouraged and frustrated. How on earth were we ever going to make Christmas happen in a house turned upside down? How would we manage the tree, the decorations, the baking? How would we wrap presents, listen to carols, find joy, find peace in the midst the noise, the chaos, the mess? To top it all off my mom and dad who I’ve lived with for the past five years will be relocating to North Carolina in January. I’ve known this was coming for a couple of months now, but still, the idea feels like a cloud looming over me, and I can’t begin to fathom just how much I’ll miss them when they’re gone. 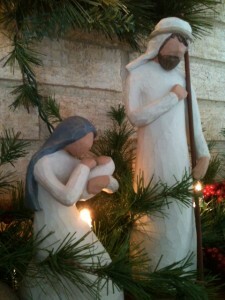 How do you handle the crushing weight of a Christmas that breaks your heart? As my house, my family, my way of life seemed to come crumbling down around me I stood before my husband and cried. Yes. Even in this. Especially in this. While my husband’s response smacked of ease and simplicity, I soon realized that he was right. (Yes, honey, you were right!) And I knew what I had to do. The time had come for me to embrace a perfectly imperfect Christmas. No matter the circumstances that come with this holiday season, the lack of perfection in my Christmas, in my life, doesn’t make me any less loved or God any less good. When Christ came to this earth on that very first Christmas, so many years ago, the circumstances that surrounded his birth were less than ideal. There is a lot about the first Christmas that wasn’t perfect and yet God used all of it to usher in his perfect plan. Out of all this imperfection…this impossible…the greatest perfection, the greatest possibility, the greatest hope was born. And this hope…this redeeming, game-changing hope…it’s as real and alive today as it was that night in Bethlehem. Our perfect Savior holds us in perfect peace, with the power of his perfect love. My Christmas, your Christmas, doesn’t have to be perfect. It just has to be about the One who is perfect. Peace, joy, and life, they never come from our hard fought attempts at perfection. They only and always come from the Savior’s perfect love. This holiday season, don’t lose your joy, your peace, or your Christmas to the idol of perfection. In the midst of the noise, the chaos, the mess, in the midst of all things imperfect, cling to the one who is perfect, and find in him the only perfection we need. A few weeks ago my husband and I stayed up late to watch a Monday night football game between the Carolina Panthers and the New England Patriots. The matchup between the Panthers and the Patriots is a memorable one for us which made watching this game extra special. When Chris and I were newly married we lived in Charlotte, NC, and even though we now live in Michigan we both have a special place in our hearts for the Panthers. Throughout our time in Charlotte, Chris and I were a part of a church group called Banyan. A mix of college students, singles, young married couples, and couples with kid, Banyan was our first taste of community. Each year, this mixed and mangled group of friends gathered together to watch the Super Bowl. With tons of chili and tons of delicious desserts we ate, and laughed, and cheered for our teams of choice. In 2004 the Panthers and the Patriots faced off in the Super Bowl, and It. Was. Epic! While most people remember this particular Super Bowl for the infamous Janet Jackson wardrobe malfunction, I remember this Super Bowl because of the friends we were with. I can hardly believe this unforgettable game took place almost ten years ago. As Chris and I watched the recent Monday night matchup, memories of that night and of this special group of friends, came rushing back mind. In 2006 Chris and I moved away from our Banyan friends, relocating first to Virginia and then to Michigan. We still stay in close contact with many of our friends from Charlotte and we’ve also been blessed to add precious communities from VA and MI to our abounding list of friends. Still, there’s nothing quite like your first love… or your first community. We have been richly blessed with a community of friends in each place we’ve lived, but somehow I think each community we’ve experienced has roots that trace back to Banyan. Perhaps you’re like me, thankful to be a part of a vibrant and thriving community. If so, might I encourage you to do everything you can to keep that community alive? Nurture it. Serve it. Invite others in and help it grow. Perhaps you’re searching for a community, a place to belong. Perhaps the well of friendship in your life is running a tad bit dry. If so, might I encourage you not to give up? Keep searching. Pray for God to lead you. Look for and take advantage of opportunities to connect, reach out, jump in. Because community is central to the very heart of God. And it’s central to the life God has for us. Think of your favorite stories. Whether it’s the classic fairy tales we read as children, or the movies, the shows, the stories we love, community, fellowship, friendship, love and loyalty lie at the heart of every noble quest, of every hard fought life. Frodo had Samwise, Merry, Pippin, Gandalf, Legolas, Gimli, and Aragorn. Aslan had Peter, Susan, Edmund and Lucy. This life, it can feel like a quest, and maybe that’s because it is one. Full of peril, adventure, romance, beauty, this life is a quest to find joy, to find peace, to find God in the midst of all that hunts us. Our lives are no different. Evil does hunt us, each and every day, and just like Frodo, we all need a fellowship to protect us, to encircle us, to show Christ to us, as we journey through life together. Sweet friends, may you wake up this day to the fairy tale found in the heart of a Godly community. May you find yourself equipped for the quest of life (or a really good football game) with a band of brothers, a community of friends, a fellowship of the heart. As evening fell on a perfect Thanksgiving Day my family migrated from the table to the couch and curled up to watch It’s A Wonderful Life. 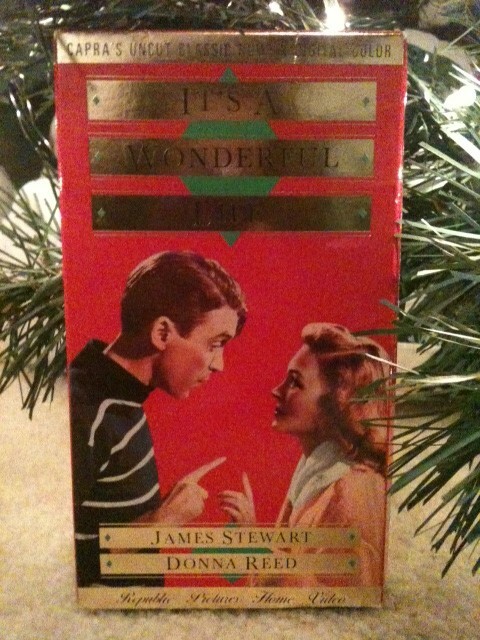 Quite possibly my favorite movie ever, this iconic Christmas classic is a holiday tradition I try to make time for each year. This year, as I watched George Bailey come back to life with Zu-Zu’s petals and a bloody lip, I realized this movie is as much about Thanksgiving as it is Christmas. While the Christmas spirit rallied the hopes of George and his community, it was a change in his perspective that brought life to his bones. And it was a heart of thanksgiving that saved him. Prior to Clarence’s arrival, George Bailey was at the end of his rope. Burdened by pressures at work, the threat of bankruptcy, the threat of jail time, he clung to the snowy rail of a bridge, looked into the icy, black waters below and believed he was better off dead than alive. All became blessings when compared to a life empty of everything George held dear. How often do we do this? How often do we live like George Bailey and fall into a trap of burden, discouragement and despair? How often do we stand on the bridge of life, peer into the blackened waters and wonder at the point of hardships, and trials, and suffering? How often do we take a blessing and make it a curse? Look around you. Look at your life. Look at the paycheck too small, the house too cramped, the loved one too stubborn. Look at the things that burden you. And imagine. What would your life look like without them? We all live with burdens we wish we could change. We wish we could blink them away. Wake up from the nightmare of pain, disappointment, and loss. But just like George, I think we sometimes fail to consider how even the burdens in our life are blessings. Unlimited elation? Who doesn’t want that? It’s what George had when he woke up from a look at his lost life. It’s what we can have too. When we take a cue from George and look at our lives through eyes of thanksgiving everything changes. Our hearts included. Sweet friends, may you wake up this day to the fairy tale found through eyes of thanksgiving. May you look around you and know in your heart that it really is a wonderful life.